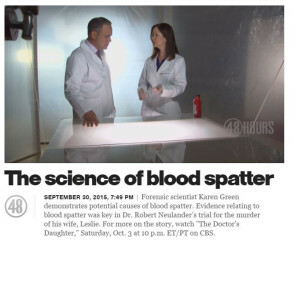 Karen will be discussing the science of bloodstain pattern analysis with CBS News correspondent Jim Axelrod on 48 Hours this Saturday October 3rd at 10:00PM EST/PST. Karen also appears in several “Web Extras” related to the episode which is titled “The Doctor’s Daughter. Karen was hired by the Onondaga County Prosecutors office to perform an analysis of the bloodstains at the scene which is the subject of the episode and later testified in the trial of Dr. Robert Neulander.